"Kastelliotika Nea" is our village newspaper. 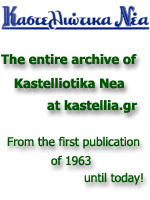 kastellia.gr has undertaken and implemented, under its own initiative, the digitization of the entire Kastelliotika Nea archive, starting from its historical 1st Publication (publication date 15/08/1963), until today. Either you are not receiving the newspaper at home, or if you want to read the current or any previous publication, kastellia.gr is offering access to the full digital archive through this page. kastellia.gr would like to thank Mr. Dimitris Halatsas, Mr. Georgios Halatsas and Mr. Vassilis Petrou for providing their newspaper archive, thus assisting the digitization project implementation.